The profitability of your underwriting decisions is based on how well you can predict potential risks and revenue. The underwriting strategies you implement affect policy approval rates, premiums, tier distribution, customer retention, loss ratios and much more. Successful strategies win you the right kinds of business from the right kinds of policy holders. Poor strategies put you at a competitive disadvantage and reduce your bottom line. 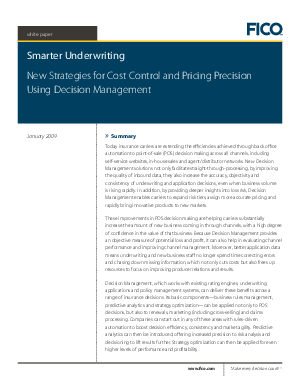 In this white paper, FICO shares strategies to optimize insurance decisioning through the use of business rules management, predictive modeling, mathematical optimization and decision analysis.